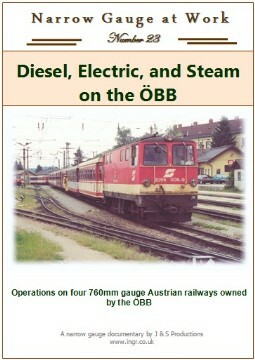 Surpisingly few of the narrow gauge railways in Austria are actually operated by the ÖBB. 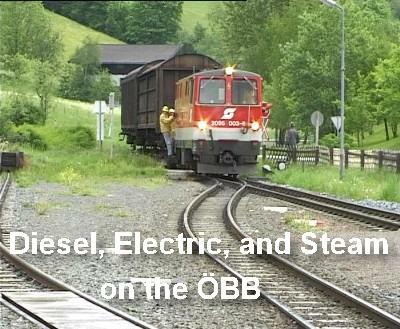 This production visits the line centred at Gmünd in its last few weeks before it was closed down. Although regular excursions still continue on this railway, there is now no timetabled traffic. 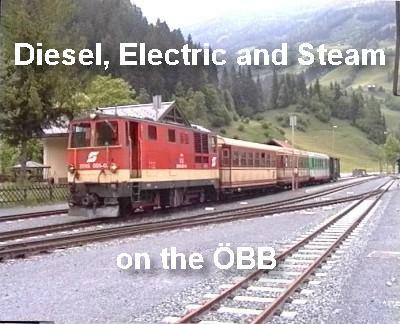 Both passenger and freight traffic is captured on the line at Zell am See, and the two lines radiating from StPolten; to Mariazell, and to Gresten, are seen. 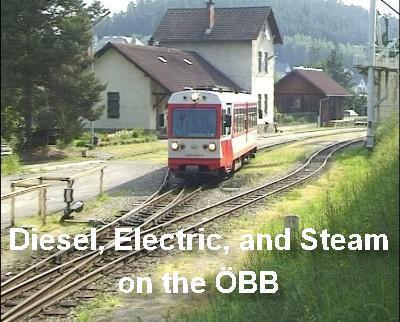 It includes footage of the Gresten line before it was truncated to its current length a few years ago. 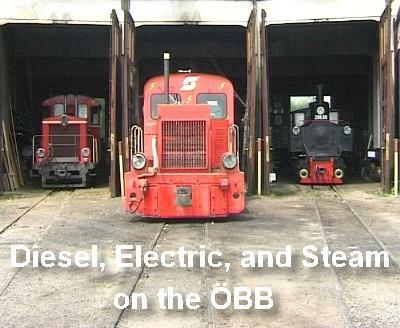 On each line steam power is also captured, focusing on the 399 class locos, No.399.01, No.399.06(Mh6), and No.399.04. Gresten station in 1997 saw the arrival of Mh6 on a special excursion. Even a local band was turned out to greet the train. 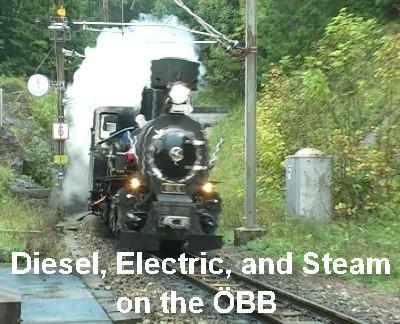 Atr ther time this was filmed most trains terminated at Mank on the Grestenerbahn. 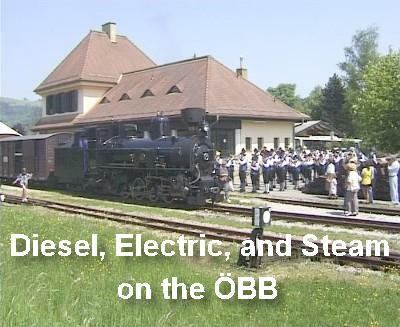 The roundhouse in Obergrafendorf is now also used to store perserved locos. 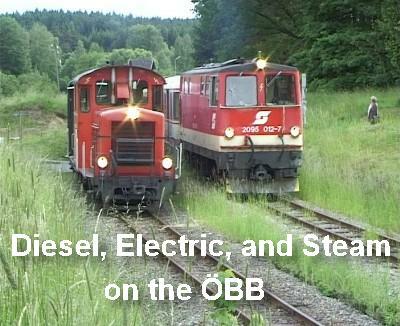 At Kircham station on the Mariazellerbahn, old meets new with the class 1099 electric loco alongside the class 4090 EMU. 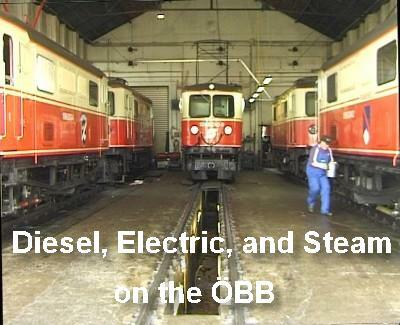 Alpenbahnhof station is where the class 1099 electric locos of the Mariazellerbahn are shedded. 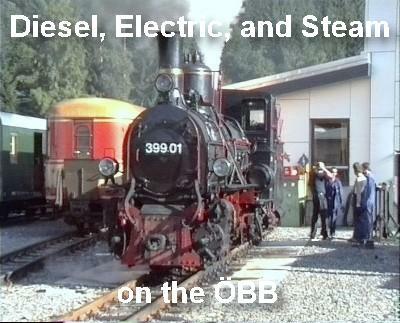 Going back to 1991, 399.01 gets steam up for one of the usual Thursday runs to Krimml on the Zell am See line. 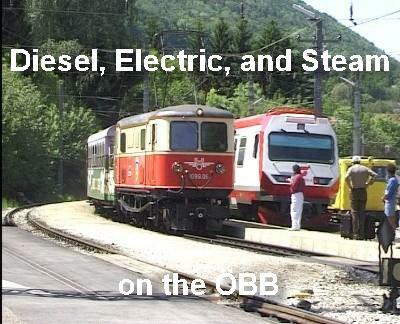 Seen at Krimml a normal service train has just arrived. By early 2006 this end of the line is still closed, pending a decision to rebuild following the devastation caused by the floods of 2005. Just prior to closure in 2001 a class 5090 railcar pulls out of Gross Gerungs station. A local freight arrives at Piesendorf station on the Zell am See line in 1997. North of Alt Nagelburg station the lines for Litschau and Heidenreichstein run parallel for several hundred meters before separating for their respective destiations. 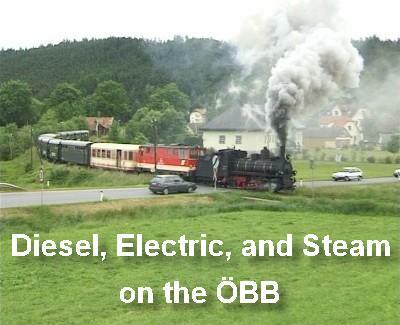 A preserved 2091 class diesel and a special excursion using a class 2095, re-enacted the dual departure. 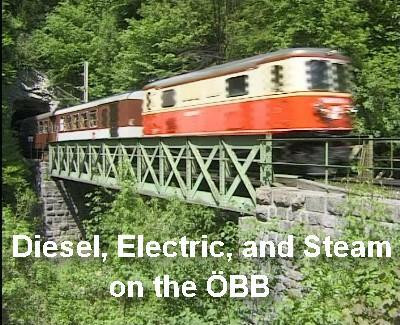 One of the 1099 electric locos emerge from a tunnel on the Mariazellerbahn. 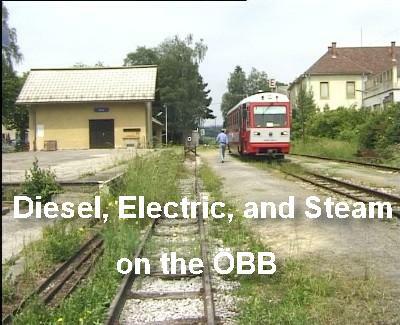 399.04 on an excursion to Gross Gerungs in 2001, just prior to the official closure of the railway. Mh6 blasts out of the tunnel by Gösing station on the Mariazellerbahn. 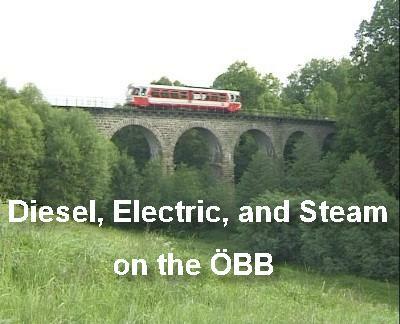 Near Weitra on the Gmünd line a railcar crosses the familiar viaduct.